As much as I’d like to get back to wearing my favourite pair of jeans, I am proud that I did not just jump into any slimming program or weight loss procedure.Though I did cut down on some of my favourite snacks ;) Neither is this post meant to urge one into taking up any, it is simply to share my experience on something that took me so long to decide. I was eager, but careful. I was recommended Liposonix recently, a non-invasive treatment with no downtime, burns fats and tightens skin at the same time. I’ve focused much of my time on face contouring, making sure I have the right facial and products to help cope with skin aging. Guess it’s time for some body contouring too. And so, I made an appointment to see Dr.Gabriel Wong at SL Clinic. “Weight loss should not be drastic”, said Dr. Wong. He advised that drastic weight loss can result in excessive loose skin or crash diet. With Liposonix, there is a dual tissue thermal effect which means skin tightening to prevent flabbiness besides breaking the fats down on targeted areas. Results are usually visible within 2-3 months. And it is designed to be a one-time treatment which one can opt to come back for more after few months. It is an alternative to surgical liposuction for patients (like me) who are not keen on invasive treatments. 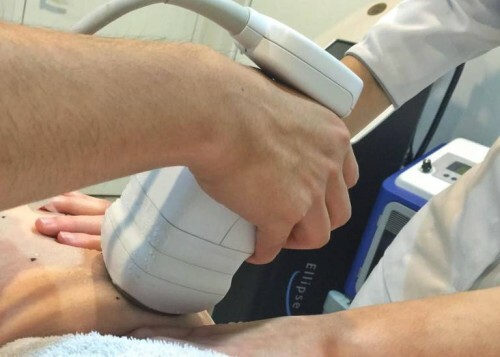 FDA approved, the concentrated ultrasound energy is directed on problem areas through a handheld treatment device to safely heat and destroy fat cells without damaging other tissues. For me, it is a nerve-wrecking experience when stepping into a clinic for such treatments. The level of discomfort, my threshold of pain, it is worth it…these are the questions popping in my head even though I have done all the research and consideration needed. Haha! So, I share my experience here for those who are also keen, hesitating and want to have a better picture of what goes on in that room. Let’s start. How much time should you allocate? My session took about 2 hours. That included registration, (longer) consultation for scaredy cats like me, change into gown, drawing of squares, photo taking (for results reference later) and the treatment itself. How do we determine how much fats to “melt”? I shared with Dr. Wong my concerns (‘jeans’) and upon his assessment, I had 18 squares on both thighs. The math. He started marking the targeted areas by drawing 9 squares on each thigh. Each square requires 4 shots of ultrasound energy. For thighs, the shot is usually powered from “35 to 40” (I did “40”, proud of myself!). This is the question I’ve been asked most. It varies and the level of discomfort can be adjusted by the level of energy delivered per shot. It’s dependent on the threshold for pain, not the amount of fats, sadly. I’d do better otherwise. Haha! Left leg started with tingling bites of sensation from the deep heat. It was very much a breeze though inner thigh was more intense for me. It got more painful towards the last shot but bearable. Right leg was a different story. It felt like needle pricking, only that you do not know when. It is the uncertainties that made it uncomfortable as there is no pattern when the next wave is coming. He is the critical part of the whole treatment. Dr. Wong was friendly, professional and kept me occupied with chit-chats and advices. The squirting of water on the targeted area helped cool down, so more water. During assessment, the nurse and doctor will take measurements, snap photos for results reference and draw squares on targeted areas. So, wear something you’d be comfortable in. I had my goal in mind, chanting (to myself) “Jeans, jeans” and imagining my fats “melting” away. Bring your phone in, play games, look at photos, text your friends, do anything just to keep your thoughts away. I took a (painful) selfie ha! The doctor matters most and after my experience, I am glad I had Dr.Wong to walk me through this. He’s also one of the few that can administer Liposonix (used mostly on tummy fats) on thighs. 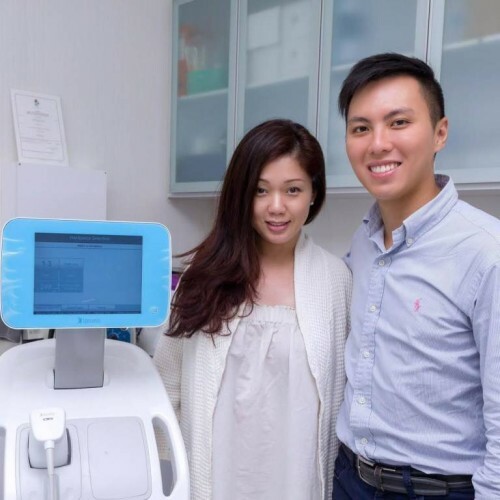 SL Clinic is one of the first ten clinics in Singapore this treatment was first introduced in Singapore. At that time, it cost about $250-$300 per square. It’s about $200 now. At SL Clinic, it is $150 per square currently (In my case for example, it’s $150 x 18 squares) which is one of the most competitive. Right on the first day of treatment, I saw that it was more sculpted and contoured on those areas. There were some bruises on my inner thighs but no downtime nor affected me in anyway. The marks subsided completely in about 2 weeks. After a month, my pants are feeling less tight. I will be heading to SL Clinic for a review soon. Till then, it’s jeans, jeans, jeans!